The status defines different project conditions and degrees of completion. You can edit the status of a project on the Management page. In the InLoox options you can define as many project statuses as needed. Each status is connected to the project progress as a percentage. 2. Select General Options and click on Project Statuses. 3. To save your changes click on OK or Apply. Choose a status from the list and click on Edit to customize the chosen status. Click on Delete to remove a chosen status from the project status list. Adding a new status won’t affect existing projects. 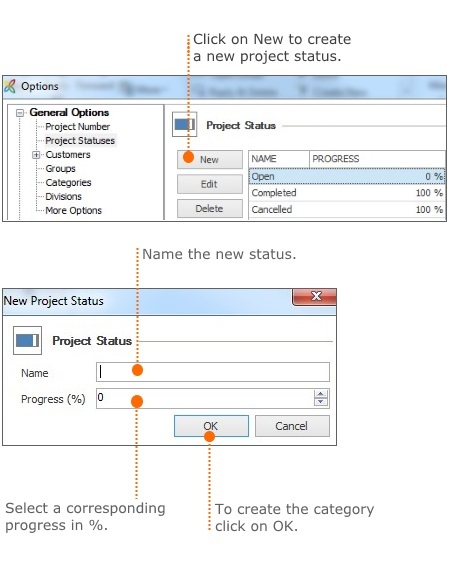 Changing the sequence in the status list has no effects on existing projects. Editing a status (e.g. name, progress in %) immediately affects all relevant projects. Deleting a status affects all projects that used it. Those stay without a status until the user manually chooses another status in the project. Edit the project statuses in InLoox 9 • Copyright 1999-2019 © InLoox, Inc. All rights reserved.